Sarge’s is generally believed to be the city’s only 24-hour Jewish delicatessen. NYPD Sergeant Abe “Sarge” Katz opened the restaurant in 1964, and the building still has the burgundy vinyl booths, Tiffany’s lamps and a wall of celebrity photos to prove it. 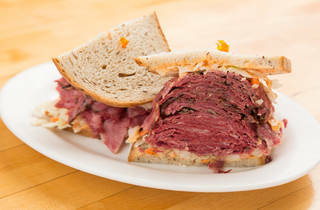 Sarge’s offers all the classic deli sandwiches—corned beef ($15.95), pastrami ($16.95), reuben ($19.95)—plus The Monster. 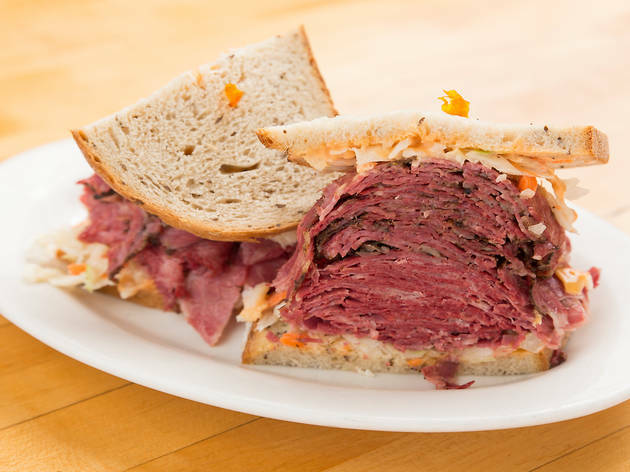 Billed as the city’s largest sandwich, it is indeed a towering stack of corned beef, pastrami, roast beef, turkey, salami, tomato, lettuce, cole slaw and Russian dressing on rye ($41.95). The menu is just as gargantuan as that sandwich, offering everything from shrimp salad ($17.95) to matzo ball soup ($6.95) to sliced London broil with mushroom gravy ($30.95). If you still have room, order a slice of the homemade cheesecake ($6.95) and an egg cream to wash it down ($2.95). You don't come for the service, but you come for the food. Sarge's may not be as famous as the other's here in the city and there's probably a reason why. Everything that we ordered was delicious and good but not great or spectacular. The matzo ball soup was ok. The pastrami and corned beef sandwich was decent. The meat wasn't piled so high that I had to gameplan on how to eat it. The onion rings were stacked high and were one of the bright spots. It's great that this place is 24 hours and I'm sure it gets a fair share of it's business outside of the normal restaurant hours, but I wouldn't stray too far out of my way to come. There are just too many other options for a Jewish deli that are better.